London, UK: 17/10/17: Nuvias announced today that it will begin distributing Lifesize’s award-winning, cloud-based audio, web and video conferencing technology across EMEA. Lifesize offers the industry’s only integration of plug-and-play HD camera systems and HD phones, plus an easy-to-use cloud-based collaboration application. High-value EMEA distributor Nuvias (incorporating SIPHON Networks, Zycko and Wick Hill) is integrating Lifesize into its recently-formed Unified Communications Practice, which offers service providers and resellers the best end-to-end Unified Communications (UC) solutions, based on market-leading disruptive technologies. Steve Harris, EVP Unified Communications for Nuvias, said: “Lifesize is a market leader with a history of innovation and disruption and was the first company to adopt an integrated, cloud-based approach to deliver intuitive collaboration services with a unique combination of hardware and software. 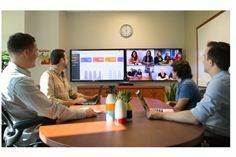 Lifesize is a key component in our portfolio of leading UC solutions, which is designed to harness the opportunities for channel partners in this rapidly growing and fast-moving market for video conferencing. For more than a decade, Lifesize has been at the forefront of video collaboration delivering high-quality technology designed to bring people together. Lifesize is focused on developing market-leading products that deliver easy-to-use and scalable audio, web and video conferencing. Lifesize combines an integrated, best-in-class, cloud-based conferencing experience, with award-winning, easy-to-use HD camera systems and HD phones so that people can connect to anyone, anywhere. Lifesize and the Lifesize logo are trademarks of Lifesize, Inc. and may be registered. All other trademarks are the property of their respective owners. For more information, visit www.lifesize.com or follow the company @LifesizeHD.